…Continued from part four.With the Honda humming along, I now had phone and internet once again. 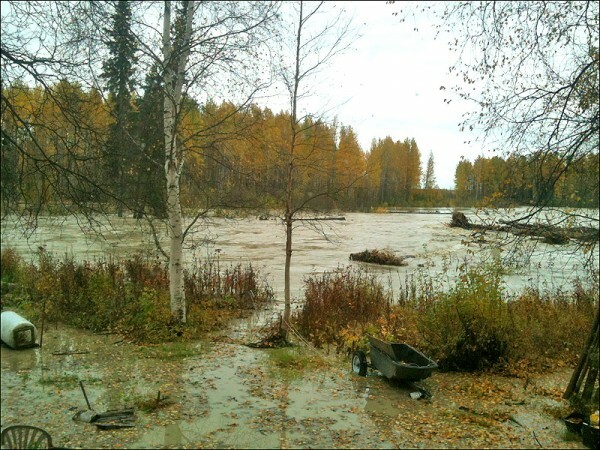 I called Steve and found out the wall of water had actually been predicted for the Susitna River, not the Talkeetna. However, this close to the confluence, it could still raise my level if the Susitna backed up the slough. Wait and watch, I guess. Now it was time to walk towards town to meet Annie. I canoed to the tracks again, and started walking south. By now the river was significantly higher than just a few hours ago. On my left the flooded woods was within three or four vertical feet of coming over the tracks. While on my right I was looking down at the flooded Chase trail, at least ten feet lower. Clearly the railroad embankment was acting as a dam. I later learned that it had the same effect in town, flooding the east side of town, while sparing houses on the west side, including downtown. Again, I noticed what a gorgeous day it was, sunshine and blue sky la-dee-dah. Made everything seem even weirder. Before long I was very happy to see Annie appear from around the bend, a brightly colored speck walking north. She said she had to talk her way past 3 roadblocks, and felt like the only rat climbing UP the ropes to the ship. Her trip across the catwalk had been very scary, the bridge just humming with the raw power of the water blasting underneath, trees smashing into the abutments, while a helicopter followed her overhead. Yes, they were in fact evacuating Talkeetna, and the road was blocked at the top of the hill on the way into town. As we walked north, I looked around through her eyes, as mine had at least a couple days to get used to the situation. The railroad embankment we walked on was the only land in sight in any direction. Everything else was a loud chaos of fast moving, ice cold brown water. Not for the first time I thought – she’s a brave woman. It was now over the upper bank and into the front yard. The dog yard was underwater. Friday afternoon the slough came over the top bank into the yard. We were running out of land! When I saw this, I knew it was time. Around four o’clock Annie said she thought we should move the dogs and ourselves to a more strategic location. I was hesitant, not wanting to leave the cabin, and not wanting to do all the work involved in relocating – I had already had a long night and day. Well, she said, we can do it now, with the sun shining, or we can do it at 3 A.M. in the dark with the rain blowing sideways. She had a point. I pulled up the river forecast on the web. The dotted vertical line represents the current point in time. 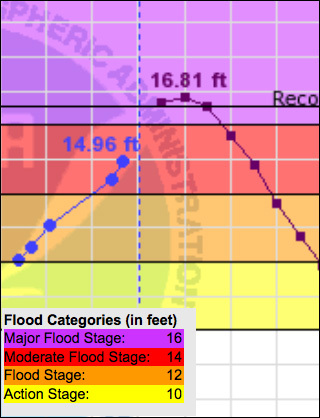 We were at 15 feet and predicted to go to almost 17. There would be no land in sight here either, and no place for the dogs to be out of the water. It was time to go. Seeing my exhaustion, Annie suggested I take a short nap, she would watch over everything, and then we would move. Gratefully, I went upstairs and passed out for half an hour. Then we started moving dogs to the west side of the tracks. What a circus that was!